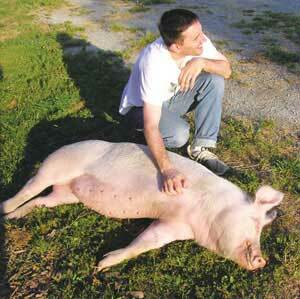 Eric Lagally, scratches Ziggy, a three-legged pig, who shows her utter contentment with a smile. 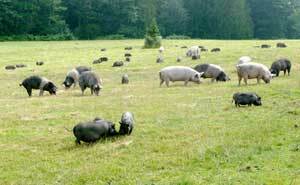 Pigs enjoy the field at Pigs Peace Sanctuary in Stanwood Wash.
"Any plans for the weekend?" my co-worker asked. "Yes, I'm visiting a pig sanctuary," I said emphatically. My co-worker's face displayed curiosity and confusion. "Why do pigs need a sanctuary?" he asked. I said I'd find out. The first two pigs we met were a cross-section of the Sanctuary's population. Ziggy, a 9-month-old pink Yorkshire pig was brought to the farm sporting only three legs but a great attitude about life. 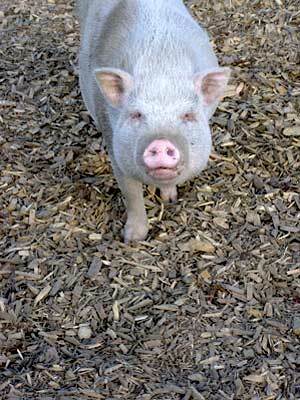 Many of the residents are former pet pigs, those sold from pet stores or breeders marketing potbellied pigs as "perfect household pets." These animals are frequently abandoned, abused or neglected when an apparently unsuspecting individual purchases a piglet and soon discovers they live with a pig who can tear down wallpaper and requires frequent attention, care, exercise and feeding for the next 18 years. But it's not just pet pigs that find sanctuary here. Pigs Peace is also a permanent home to pigs used for medical research, taken from horrible conditions on factory farms or cast off from the entertainment industry. "If people feel the work we do is important, we need them to support the Sanctuary," said Woods, who works on fund-raising and updates Facebook daily to keep the public informed on the pigs. And while the couple doesn't claim to be vegetarian, Faoro said that she and her husband don't eat pigs. "It's hard to bond with these animals and not make that shift," Faoro said of their decision to stop eating pork. In the heart of Seattle's University District is an upscale vegan grocery called Sidecar for Pigs Peace. Store manager Doh Driver and her team of volunteer store keepers operate the colorfully displayed grocery offering a wide variety of foodstuffs, including high-quality mock meats, vegan marshmallows and even vegan cat and dog food. Driver says some of the most popular items include a cheese substitute out of Scotland called "Sheese," and vegan corndogs, a customer favorite. CHRISTIE LAGALLY is a freelance pet columnist who manages the website Sniffing Out Home: A Search for Animal Welfare Solutions at www.sniffingouthome.org.